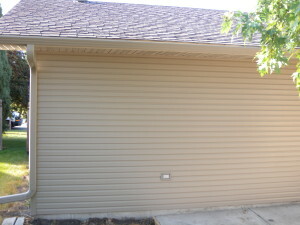 Seamless gutters are the ideal way to protect your home in the Minneapolis, Minnesota, area, and DuBois ABC Seamless is the company to call to get the job done right. The sturdy construction of our gutters – which are made from 28-gauge galvanized steel – means they can handle even the most torrential downpours, and also withstand the strong winds and hail that can sometimes accompany such storms. They won’t even buckle or crumple under the weight of your extension ladder. A gutter system made of any other material simply cannot provide your home with the same level of protection in the midst of severe weather. But it’s not just the strength of the steel we use that is important – it’s also the quality of our craftsmanship. Our seamless gutters will be fabricated right at your home, whether you live in Minneapolis, MN, or any surrounding suburb. Our factory-trained installers use the exact dimensions of your home, ensuring a perfect fit. This precise construction and installation process enhances the inherent strength of our steel gutter system, and by eliminating unsightly, leaky seams, the result is a system that looks and performs flawlessly year after year. Minimal maintenance requirements – You’ll never have to paint or scrape our steel gutter systems, and they’ll look as good as new for years to come. Cohesive appearance – To enhance your home’s curb appeal, our seamless gutters are made to blend in with your home’s soffit and fascia. Dependability – Whether it’s heavy summer rains or ice and snow in the winter, our steel gutters can stand up the harshest weather the Midwest can throw at them. To learn more about how our seamless steel gutters can improve your home in the Minneapolis, MN, area, contact DuBois ABC Seamless today.